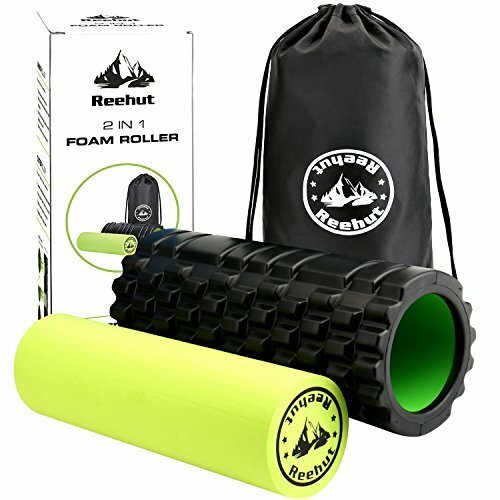 Reehut 2-in-1 Foam Roller. Trigger Point massage for Painful, Tight muscles + Smooth Rollers for Rehabilitation! FREE USER E-BOOK + FREE CARRY CASE! Product prices and availability are accurate as of 2019-04-16 04:52:23 UTC and are subject to change. Any price and availability information displayed on http://www.amazon.ca/ at the time of purchase will apply to the purchase of this product. Outer foam measuring 13" x 5.5" and inner foam measuring 13" x 3.8". 100% EVA material (outlasts ALL cheap quality foam rollers). Lightweight and portable, comes with a FREE CARRY CASE for easily taking and storing. Release Myofascial trigger points and loosen knots in muscles, especially for back, calves, shins, quadriceps, IT band, hamstrings, Adductor, Piriformis, lats, and glutes. FREE 18 PAGE E-BOOK to show you how to foam roll correctly + safely.